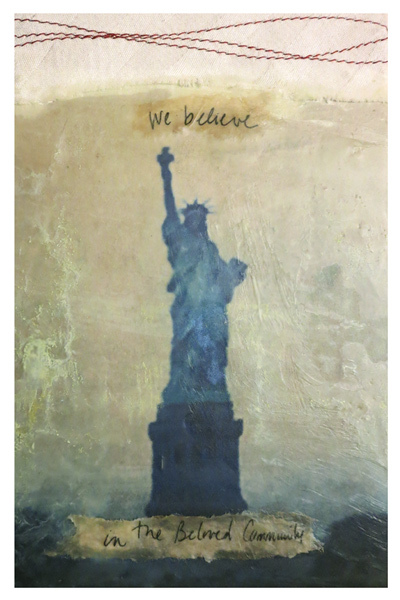 Last year Stephanie Sharp of Blissful Heart Studio asked me to contribute an uplifting image of resistance. 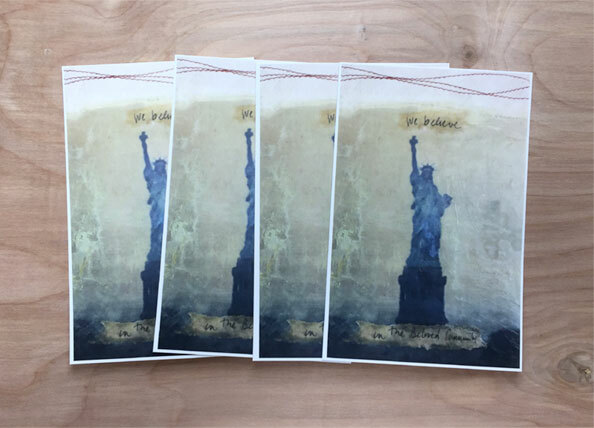 She was creating a postcard collection for people to use to write their representatives and our government to let them know that we are aware of what is happening and will not be silent about the attacks on our constitution and on the safety net of society. More than a year later we are continuing to see the undermining of the social safety net and attacks on the ideals that our country is based on, on human decency, and our environment. I often feel overwhelmed and voiceless reading the news. I decided though that as an artist, my duty is to voice our collective concerns and our ideals. 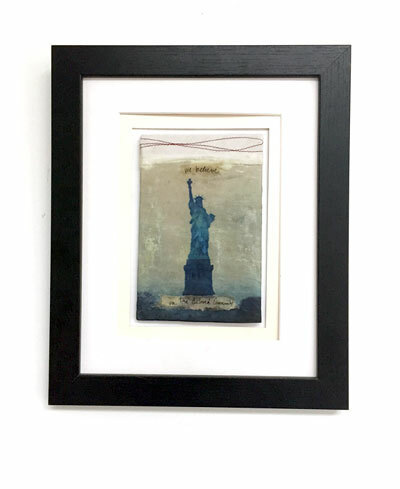 The mixed media piece I created for the postcards last year is framed and is in my studio. This piece is just one of those that I don’t want to depart in. It is a reminder everyday of what this country stands for and what civil rights activists have marched towards for generations. We have yet to achieve it, but we must continue to fight for it, especially to fight against the loss as we are seeing with this current administration. 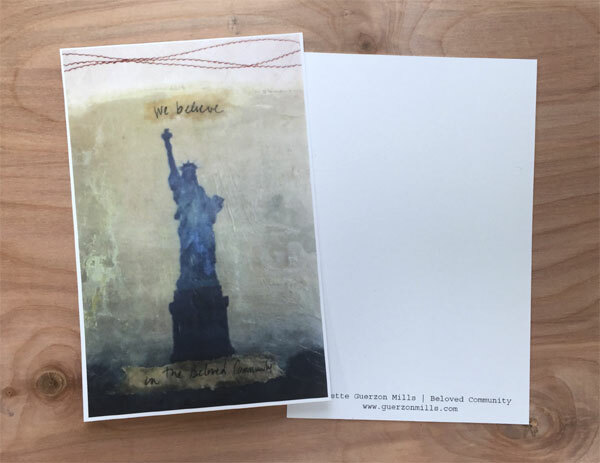 I am offering fine art prints and postcards of Beloved Community for sale, with 100% of the proceeds going to the ACLU through the month of July 2018. This is the original piece that I framed and matted and have it hanging in my studio. Fine art print of Beloved Community is a 4×6 inch image printed on an 8 1/2 x 11 inch archival museum rag, signed and is available in The Shop. I also had 4×6 inch postcards made of Beloved Community as well. You can see the front and back view of the postcard. This postcard can be hung as art or sent out as a postcard. A set of 4 postcards are available in The Shop. I love my country and the ideals of what it stands for. As a daughter of immigrants from two different countries, this was installed in me from the very beginning. My father, especially, loved his adopted home and taught me from a very early age how lucky I was to be growing up here, to be an American. I can still here his voice telling me that because it was repeated so often. This is a privilege I do not take lightly. I believe in my country and I believe in the Beloved Community. Thank you for your support in purchasing these prints and postcards.